Kisumu religious leaders want ballot boxes out of the region to avoid "Massacre." -Rev Joshua Owiti - Bana Kenya News, Real African Network Tubanane. 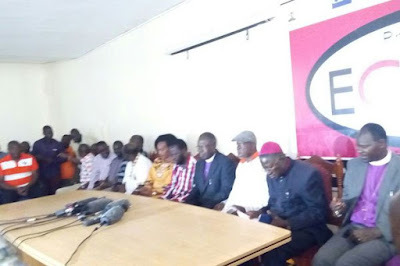 The Religious leaders in Kisumu have come out with their report saying that the Polls should not proceed in the region. The leaders said if the police want to butcher and kill more Luos then they have urged the police and the IEBC to continue with the elections. The Religious leaders have called the IEBC to collect their ballot boxes and leave the region in peace. The leaders said that if the Government want to continue with the ethnical profiling butchering the Community then IEBC should continue with their activities. The church leaders included Rev Canon Joshua Owiti of the Diocese of Maseno East, Rt Rev Francis Mwai Abiero (Bishop of the Diocese of Maseno West), Rev Prof David Kodia (Bondo), Arch Bishop Habakuk Abogno (Church of Christ in Africa) and Bishop Betty Onyango (Africa Nineveh Church). They called for the withdrawal of all the security agents in Nyanza and asked IEBC Chairman Wafula Chebukati to pick the ballot boxes and return them to Nairobi. Kisumu Senator Fred Outa, Woman Rep Rozah Buyu and a host of MPs and MCAs said they were not interested in any elections in October. "We know Chebukati is trying to justify his alleged 48 percent turnout in the sham elections but he must know we are not interested in their charade," said Mr Outa. "We reject their planned polls… I’m a staunch SDA adherent and our right as a church must be respected," Mr Okello said. The clergy asked Interior acting CS Fred Matiang'i to withdraw "the large contingent of paramilitary police from the region." The Interior CS is now withdrawing security forces from Mombasa, Nairobi, Eastern to Lamu, Western and Nyanza for the repeat polls. The leaders urged the CS to stop such activities and leave the regions in harmony or else the division will be much wider.